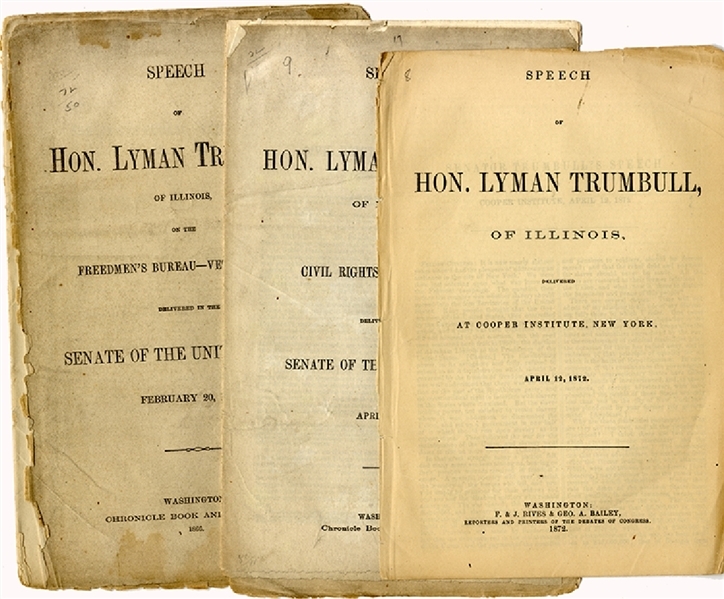 Three Lyman Trumbull Printed Speeches to include; “Speech of Hon. Lyman Trumbull, of Illinois, on the Freedmen's Bureau--veto message: delivered in the Senate of the United States, February 20, 1866”, Washington 1866, 16pp. in small part, “I have sought to forward such measures as would protect the loyal refugees and freedmen in the rebellious States.... It does little more than give the sanction of law to what is already being done without any statute authorizing it. The Freedmen's Bureau, as I have said, already exists. Courts are held by the Freedmen's Bureau throughout the entire region of country where that bureau is in operation.....” Very good condition. ... plus, “SPEECH OF HON. LYMAN TRUMBULL, OF ILLINOIS, ON THE CIVIL RIGHTS - VETO MESSAGE,” Delivered April 4, 1866. Trumbull argues that Congress does have the power to “ eliminate a discriminatory "badge of servitude" prohibited by the Thirteenth Amendment..” It is the first legal effort to establish what becomes the 14th Amendment Very good condition...plus, “Hon. Lyman Trumbull ... Delivered at Cooper Institute ... April 12, 1872” whereby Trumbull raises the issues of corruption of the Grant Administration and rants for change in the Republican party. VG.